When will The Beguiled premiere date. New release date on DateReliz.com: trailers, spoilers, cast. 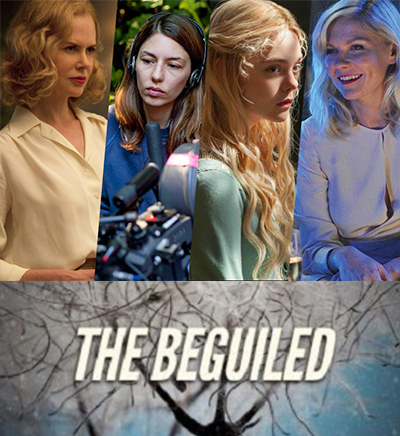 The Beguiled – this title will present you a lot of interesting and amazing information. The genre of the film is Western drama, so it is rather unusual. Film The Beguiled will appear on the movie screens on the 23rd of June in the year of 2017. The director of the film is Sophia Coppola. As for the producers, here we must mention Roman Coppola, Sofia Coppola, Youree Henley, Robert Ortiz, Anne Ross, Fred Ross. The scriptwriters are Sofia Coppola and Thomas Cullinan. The acts of the film take place in the ancient times when America was divided into several territories and it wasn’t the only one united country. The North people always struggle with the South people and nobody knows when the end of this war will appear. During one of the battle handsome boy by the name John, who was the corporal of the North Army, was wounded. But one young woman wanted to help him, so she saved his life by taking John to her home. When the time had gone, she left this hero to the boarding-school, where the greatest people work and live. She believes, that such people will help him to survive and to become a better person. In this building there live 7 unmarried women and each of them has the feelings to this man. These people try to make everything, what they can do in order to save the life of beautiful man. From the time he realized, that he is in the society of pretty women, where each of them is really good and smart person. All the women are slim and communicable people – nobody could hack off. The most interesting thing, that these girls try to show their best in order to get the attention of the handsome man. Of course, he is really happy to live in such company, but he didn’t understand, what will be the consequences of it. To be honest, such a cinema masterpiece will be really interesting for people of all the ages and social status, so you must find a little time to watch it and enjoy every moment.